Why is this the best SEO plugin for WordPress? 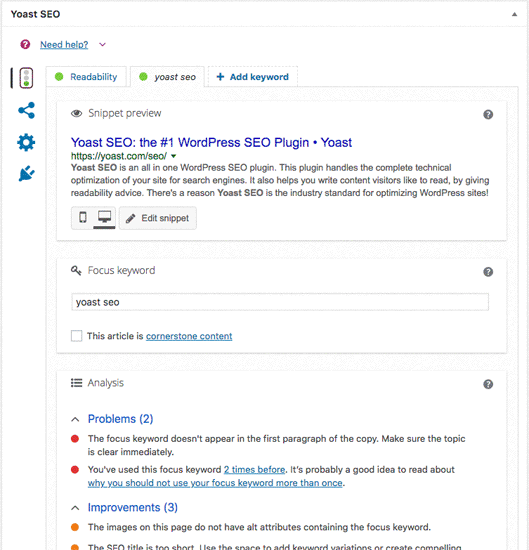 Hands down, WordPress SEO by Yoast is by far the BEST SEO plugin for WordPress sites. 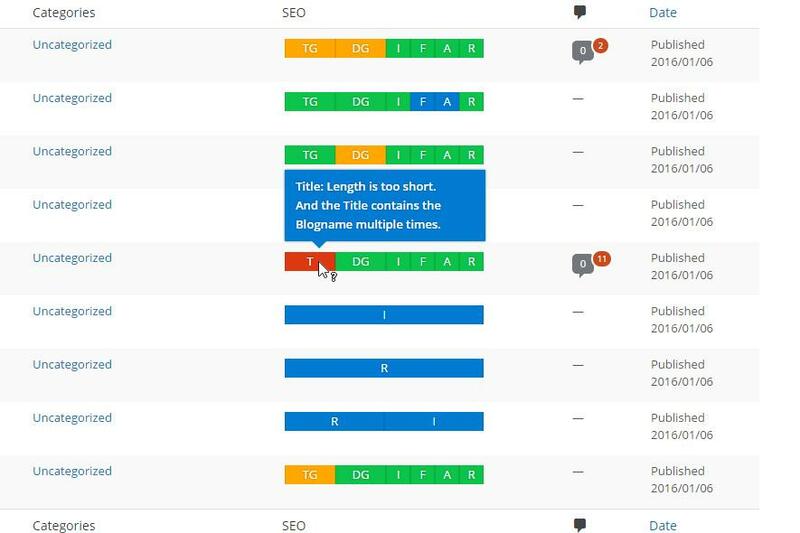 If you’re someone who is struggling to optimize your content for more search traffic, this free WordPress SEO plugin is a treat for you. Here are some of the best features of using this free best WordPress SEO plugin in 2018. The #1 reason to use this plugin is this: it helps you easily optimize your blog posts for your primary keywords. The key to getting more search engine traffic to your sites is to find better keywords and use them within your content. This plugin helps you with optimization part and tells you where to insert your keywords for more search traffic without getting penalized by Google. If you’re running a WordPress website, you must need this plugin as it helps you better index all the pages of your site on search engines like Google, Bing, Yahoo etc. This plugin has been downloaded over 2 million times and it is one of the most popular WordPress SEO plugins. Google ranks not just websites but more importantly the pages within websites so crawling your pages is essential. A sitemap is the heart and soul of any website because it makes easier for Google to find your site’s pages. This plugin makes it easier for Google to crawl all your website’s content including pages, blog posts etc. Just activate and configure the plugin, and it will ping the search engines whenever your site gets updated. Your website page loading time is one of the most important things. Did you know that website speed is a crucial Google ranking factor? If your website is taking too much time to load, not only it hurts your search engine rankings but also affects your overall website’s bottomline. Here’s where W3 Total Cache plugin comes into handy that helps you reduce your page loading times through caching. This is one of the widely used WordPress SEO plugins for increasing a website’s speed and performance. It helps your site by increasing website performance, reducing download times through caching, content delivery network (CDN) integration etc. One of the most common tricks hackers use to get access into your site is through brute force attacks where they try a variety of usernames and passwords. If you’re worried about security your site, I strongly recommend you to install this security plugin. This plugin helps you better secure your site by limiting login attempts (it also blocks IP addresses if there are too many login attempts are made). Securing your website’s login page is one of the best ways to safeguard your site from all the common security attacks such as brute force login attempts, password guessing etc. WP Limit Login Attempts plugin is a free WordPress plugin that adds better security to your login page by limiting the login attempts from hackers. Quick note: 000webhost.com, a free web hosting solution has an amazing article on securing your WordPress login page that demonstrates you how to secure login page. Make sure to check out 000webhost if you want to host your site for free! Tracking your website traffic is the key to know your traffic sources, audience behaviour, top performing posts etc. Although there are a ton of website tracking tools available but nothing comes close to Google Analytics. Accessing your Google Analytics page is often a time taking process. Here’s where this plugin comes into handy where you can easily access all your Google Analytics data from your WordPress dashboard. Install the plugin, connect to your Analytics account and you’re done. Are you new to SEO? Do you want to better optimize your content and improve your website rankings on search engines like Google? Then, you need this plugin which is completely automated and gives you excellent features which are listed below. Here’s a screenshot of how you can improve a web page by hovering on it. If you’re a beginner who is looking for ways to easily optimize your content to boost your search engine rankings, this is a must have WordPress SEO plugin. It works out of the box and comes with predefined settings so you don’t have to make any further changes to get better rankings on Google. If you’re looking for an SEO plugin for WordPress which works out of the box to helps you increase the search engine visibility of your site, this plugin is for you! If you’re looking for an all in one SEO toolkit, this plugin is made just for you. As the name suggests, this is an all in one SEO pack which does so many things from optimization to sitemaps to increase your search engine visibility for your sites and it works out of the box. Install, activate and you’re done! Are you an affiliate marketer or do you want to cloak your messy and long affiliate links into short and beautiful URLs? If yes, you need a link cloaking plugin to easily cloak your affiliate links. ThirstyAffiliates affiliate link manager is one of the widely used and most effective WordPress plugins for link cloaking. Gives you so many options from opening your affiliate links in new tabs to link cloaking. It makes it really easy to cloak your affiliate links (here’s how it generally looks like: http://domain.com/recommends/your-affiliate-link). It also gives you all the stats of your clicks so you can easily find out which links are performing well. Broken links, 404 error pages, dead links – whatever you call them, they are all bad and can really hurt your search rankings on Google. Unfortunately we don’t focus too much on fixing our dead links and here’s where you need a plugin like “Broken Link Checker” that helps you easily find and fix your broken links. Once the plugin is installed, it starts working and finds all the broken links and missing images within your website. You can fix your broken links from the plugin’s page which makes this plugin unique and highly useful. Are you worrying about high bounce rates on your blog? Then, I’ve a quick tip for you where you can instantly reduce your website’s bounce rate. Start opening your external links in new tabs and also make sure to add nofollow tags to most of your external links such as affiliate links, social media links etc. With this plugin, you can easily do both the tasks and it works seamlessly with WordPress interface. Have a look at the following screenshot. See that? You can easily open your external links in new tabs and also add nofollow tags. Although there are a ton of other WordPress plugins that do the same work this plugin does, this plugin tops the list because it is simple to use, free and lightweight plugin which doesn’t affect your website loading times. This plugin is especially useful for affiliate marketers who deal with affiliate links. Here are some of the benefits of using the WordPress SEO plugins in 2018 and beyond. Increase your website’s search traffic: One of the primary reasons to use best free WordPress SEO plugins is that they help you increase your search engine traffic quickly. So if you’re someone who’s struggling to get more traffic from search engines like Google, start using the best SEO plugins for WordPress mentioned above. Speed up your SEO process: SEO tools and plugins help you save your time and they speed up your SEO process to get results faster. They help you find keywords, backlinks, website traffic really quickly and most of the SEO tools give you accurate results. Assess your competitors better: If you want to master SEO or get better results from search engines, you need to learn how to analyse your competitors. The only way to get better SEO results is to evaluate your competitors metrics such as backlink analysis, keyword analysis, website traffic estimation etc. Here’s where the best SEO tools like SEMrush, Ahrefs, Moz can help you like a charm. Although there are hundreds of best SEO plugins for WordPress available, the above list of 10 plugins are highly recommended. These are the plugins I’ve been using over the years to get more traffic and sales to my sites. So what are your thoughts? Did I miss any of your favorite WordPress SEO plugins in the list? Share your thoughts in the comments.